California Genealogical Society and Library blog: New Shelves in the Library! New Shelves in the Library! 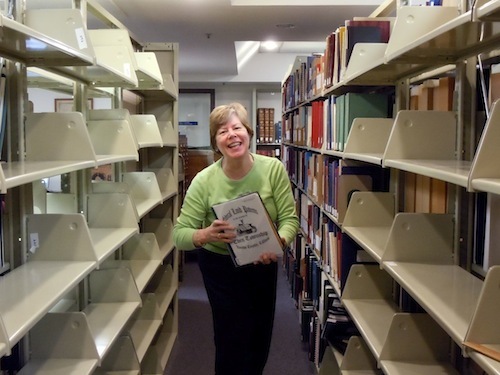 There's been lots of activity in the library this month as the contents of close to 600 shelves of books were moved over a period of just two weeks. This was the culmination of a space review and "remodel" that included the purchase of ten new shelving units paid by an anonymous donor. 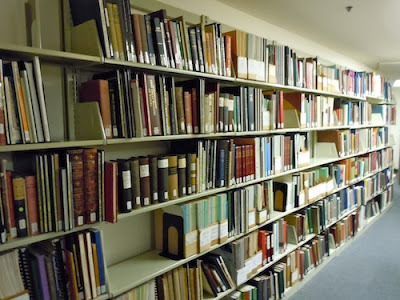 Once the new shelves were installed the process of "shifting" books began. Many responded to a call for volunteers, including members of the Library, Look-ups and Desk Committees. Special thanks to our librarians Laura Spurrier and Diana Wild for overseeing the project and to our member volunteers who worked tirelessly: Judy Bodycote, Nancy Fike, Steve Harris, Jane Lindsey, Arlene Miles, Shannon Reese, Lavinia Schwarz, Pat Smith, Roland Smith, Jim Sorenson and Judy Zelver. Temporary signs have been put up to help patrons locate books until our exhausted librarians have time to create new permanent ones. Photographs by Kathryn Doyle, 5/28/2011, Oakland, California.